With the rise of Internet access and social media, cheating has gone beyond the seedy motel to the growing trend of online infidelity. According to the American Psychological Association, Americans spend at least 13 hours a week online—as much time as they spend watching TV. Because of this, cheating is no longer hindered by limited availability or location. Now you don’t even need to leave your home to be unfaithful. Online infidelity is an emotional affair that takes place via online communication sources such as Facebook, chat rooms, and emails. Even if these affairs don’t end up becoming physical, the emotional attachment formed and the hurt to the cheated-on partner is no less detrimental or vow-breaking. 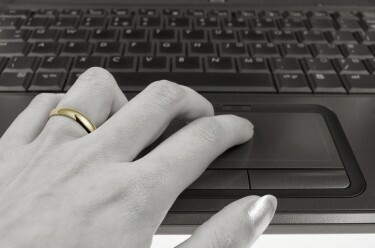 Internet affairs often come from marital or relationship problems. It’s easier to run from the issues than trying to face them, so a person may turn to someone new to fill voids that are in their current relationship. Of course, the grass is always greener, and people assume that they will only get the positives of their new relationship without acknowledging the negative aspects that come along with every partnership. A cheater also forgets the positives of their current relationship that would be lost if they left their significant other. Because no one intends to have an affair, it often starts small. It could be a complimentary Facebook message from a high school acquaintance, or a slightly flirtatious email from a coworker. No matter how it starts, online infidelity can often be hard to define until you’re in too deep. The best way to remove the temptation all together is to not say anything that could lead someone on. If you think you’re just being friendly, double check with yourself: if whatever you’re sending would need to be deleted or hidden from your partner, it is wrong. Don’t rationalize the behavior simply because it’s not physical—the damage is still being done. If you or your partner has been caught in an online affair, realize that rebuilding trust is a long, uphill climb and sacrifices need to be made by the person who cheated. Because there is no way to completely “delete” someone, it is important to be open and allow your partner to have full access to your Internet presence—even if it means deleting Facebook and other social accounts and letting your partner see your phone and computer at a moment’s notice. If they are not willing to make those sacrifices, they probably don’t want to change. This is also important to recognize, as these characteristics will often lead to more affairs in the future. Before you turn to chat rooms, remember that it’s easier to try to work through relationship problems now than attempting to clean up the mess of an affair later. Give your current partner the dedication and respect they deserve by communicating your issues with them instead of living with resentment from unresolved issues. If you or your partner is struggling with an online affair, or if you’re looking to discuss your relationship problems with someone, Stenzel Clinical has many counselors that can help. Reach out to make an appointment today.